What happened to the month of February, WOW it flew by? March is here and it is going to be “crazy busy”. Consider attending GROWing in the Garden Day which is a free event at the Fort Worth Botanic Garden campus from 1-4 pm on Saturday, March 3rd. This event is designed for families to explore the outdoors together. ONA’s annual Shamrock Porch Crawl* is scheduled for March 17th. This fun event was well attended and enjoyed by all last year. Good Neighbors, Great Neighborhoods will be held March 21st, 6-8 pm, at the Modern Art Museum of Fort Worth to discuss how to design and plan sustainable community developments that serves all. ONA’s Beautification Committee is spearheading a group of volunteers to participate in the Keep Fort Worth Beautiful Cowtown Great American Cleanup on March 24th from 9-11 am. The ONA Newcomers' Dinner is scheduled for March 26th. March 31st is designated for the famous ONA Easter Egg Hunt* in Oakhurst Park. Children and adults enjoy this event. ONA will have their annual Spring General Membership Meeting on April 26th at the Calvary Christian Academy. The agenda will include election of officers, an update from a Six Points Urban Village Developer, and the results of the ONA survey**. Please complete the ONA survey by April 12th so that your opinions will be known and addressed. I hope to see you at one or more of the upcoming ONA events. Try to attend The ONA General Meeting, as it determines who will guide ONA for the next year. Know that together we are stronger than apart, yet it takes each of you to contribute some of your time for ONA to be a great neighborhood. I know that each of you are very busy, yet I challenge you to consider becoming more active with ONA. Studies suggest that involved/social individuals live longer. Improve your longevity by calling or emailing me on how you would like to volunteer with ONA! *You will find additional information on these events throughout the Oak Leaflet, oakhurstfw.org, and/or Nextdoor. **Also found on Nextdoor and oakhurstfw.org. NOTE: The March ONA social scheduled for the 8th has been replaced by the Shamrock Porch Crawl. ONA 2018-'19 Survey Now Open! Oakhurst residents...we need your input! The Oakhurst Neighborhood Association is required to periodically review its bylaws and operating procedures. With many new residents moving into the neighborhood, now is a great time to request your feedback on how things are currently handled in ONA. We want to remain a valued, relevant organization for residents. Complete the 2018-'19 survey by clicking on this link or the image below. Thank you in advance for your participation! Check Out February's Oak Leaflet! 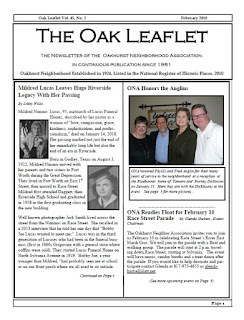 February's issue of The Oak Leaflet is now online! Read about ONA's parade float for the upcoming "River East Mardis Gras" on Race Street (2/10), as well as Libby's article on the Riverside legacy left by Mildred Lucas. You'll also find Elizabeth's President's report, Debby Adams' patrol report, info on upcoming neighborhood events, and more! I am hopeful that February will be a slower month for me. My job duties doubled in January along with every weekend filled with work, family or volunteering events. I am looking forward to ONA’s Monthly Meeting scheduled for February 8th as we have not met as a neighborhood in a while. We will review upcoming events, discuss the current status of ONA goals, and the April General Meeting. Please let me know if you would like to add any items to the agenda by February 6th, 2018. I recently had an experience which reinforces the importance of knowing your neighbors. I had just returned from Abilene, after a two-day trip, walked into the back door, and heard water gushing out from my kitchen sink. I tried to turn off the kitchen sink’s water valve without success and couldn’t identify how to stop the water. I threw some towels down and ran across the street to Charles Witt’s house for help. He quickly grabbed his customized water main turnkey and shut my water off. He then help me determine the source of the water leak, which was a compression valve that had popped off. He called our other neighbor, Scott Redfield, verified the solution and corrected the problem. Scott came over the next night and evaluated the rest of my plumbing. Without these lovely men, my house would have had sustained significant damage, and my pocket book would have been hurting. Please take the time and effort to get to know your neighbors, as you might need them someday. I hope to see you at the February meeting, or consider participating in the Neighborhood float on February 10th (details in Glenda’s article in the Oak Leaflet). If you were not able to attend Fred & Phyllis’s Celebration Tea, you can still show your gratitude for their years of services by contributing to a tree fund in their honor. You can donate at the monthly meeting or via PayPal on our ONA website.